We have some news for you this week about our Attack of the Shapeshifters. Let’s dive into the sea-full of changes and details! We have got different feedback about our new battle calculation system and one of the main pain points was the problem of defense underestimation. There is why we decided to improve our point formula and after the update, defenders will also get Charms after a successful defense. With this update, we will also implement a new exclusive bonus which can be used only in the Shapeshifter event: “Charm Booster”. It increases the number of shapeshifter charms earned when attacking shapeshifter totems and you can use multiple charm boosters per attack. From now on your castle will be surrounded by 10 Shapeshifter enemies. To attack each target you will need “Attack runes” and you will be able to choose your 5 opponents from a broader pot of 10 Shapeshifters now. Every day you will get 5 Runes for free and you can purchase the other 5 for premium currency. Your ranking will still be counted according to your best Point Series. Purchasing your first rune will start a new series. Thereafter your purchased runes will continue to add to that series. On the other hand, we will significantly lower the price of the Shapeshifter equipment items from the set "Materials of the Master Summoner", decoration, and material sacks in the Insignias shop, to make it more affordable to all of you and to make it fit to new event iterations. During Attack of the Shapeshifters event, Equipment trader will offer you a new temporary equipment set. The duration of the set will be 7 days long and it will have unique bonuses which will work only on Shapeshifter targets. Every item will be already on the level 20, and you do not need help of Technicus for this set. Remember, that it is impossible to embed the gem in any of the equipment item from this set. We will keep a track on the performance of this set and its influence on the overall game and event experience. There is much more to come with this update, so stay tuned for more info this week! As promised, here is our second teaser for our upcoming March update. Check out next months content package! This month will hopefully bring good fortune and joy for one and all as the nobles of the Great Empire celebrate the arrival of spring by hosting the Emerald Trial. The diminutive Shamrock nobles are willing to share their pots of gold and pocket money with any warrior brave enough to join these festivities! This longterm point event will run from March 6th until the 24th of March. Well-fitting to this event, you can obtain the Leprechaun mask from the Equipment Trade during the Emerald Trial. We adjusted some offers according to your need on the eventful battlefields. 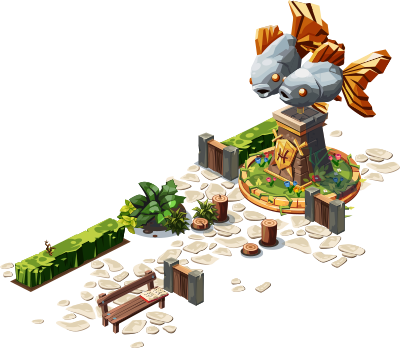 You can win a new decoration in the next royal quest campaign, it is called The Fish (PO 320) which symbolizes another Zodiac sign. There is still a bit more to come in this update, so stay tuned for more info coming this week!